The General Agency real estate offers for sale, at The tourist port of Rome, two berths of 109 square meters each, with parking and garage. The mooring is located in the Western basin with an average depth of 3.50/4.50 meters. The dimensions of the berths are: 5.00 meters width, capacious a mooring of boats up to 18 meters long. 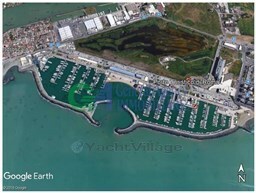 The price for each individual mooring is € 75,000.00. The construction of the piers is reinforced concrete, they are "fixed" and are underpinned by reinforced concrete piles. The mooring is equipped with: socket for drinking water and washing; the electricity socket: aft bollards and mooring rings; pendino, rope and chain for the forward berth to the dead body. The tourist port of Rome opened in June 2001, is located immediately south of the mouth of the Tiber River only 10 minutes drive from the international airport of Fiumicino-Leonardo da Vinci and the beautiful ruins of Ostia Antica, in the area of Pasolini memory of the idroscalo di Ostia. The complex of about 200,000 square meters is a modern concept of Marina, founded on integrated structures can offer a great range of services ' sea ' and ' Earth ', accommodation opportunities in terms of both business and leisure. Represents a modern Marina with integrated structures dedicated to aquatic activities-with its 833 berths for yachts up to 60 meters-and on the ground with a promenade of almost 1 Km and .5 overlooked 80 listings among restaurants , bars and shops, 10,000 square meters of exhibition and entertainment, an 800-seat amphitheatre, a central Beach and more than 2000 cars. Behind the port is a large OASIS LIPU. The structure is accessible 24 h.; the shops are observing days and hours of operation. Energy class apprilcabile not.